The Sebelius goodbye package also lets states be tough on "non-navigator assistance personnel." Insurers may have a chance to sell fixed indemnity health insurance to workers who get weak “minimum essential coverage” (MEC) from self-funded employee health plans. The Small Business Health Options Program (SHOP) exchange divisions run by the U.S. Department of Health and Human Services (HHS) will start their 2015 exchange plan “election periods” Nov. 15 — the same day that the 2015 individual exchange qualified health plan” (QHP) open enrollment period is set to start — but states with state-based exchanges can begin their SHOP election periods earlier, if they want. Officials at the Centers for Medicare & Medicaid Services (CMS), an arm of HHS, have included regulations regarding those matters and many more in a new batch of final regulations. HHS is preparing to publish the regulations, which are based on draft regulations released in March, in the Federal Register. The fixed indemnity provisions in the regulation apply to hospital indemnity insurance policies and other policies that qualified as “excepted benefits” — benefits exempt from the provisions in the Health Insurance Portability and Accountability Act and the Patient Protection and Affordable Care Act (PPACA) that normally apply to major medical policies. Originally, HHS had suggested that it might permit only the sale of fixed indemnity policies that pay a fixed amount of benefits for a specified period of time. In the draft regulations, HHS said it would let an insurer sell a fixed indemnity policy that pays either a fixed benefit per period of time or a specified amount when a triggering event, such as a hospitalization, happens. But HHS said it would let an insurer sell a fixed indemnity policy only to consumers who have MEC — enough major medical coverage to get the consumers out of having to pay the penalty PPACA is supposed to impose on taxpayers who lack a minimum amount of coverage. In the new final regulations, HHS has decided that consumers who buy fixed indemnity coverage must have MEC. But insurers need not verify whether or not the buyers actually have MEC. Insurers simply must have the buyers state that they have MEC, CMS officials write in a preamble to the regulations. Self-insured employers apparently can provide MEC with plans that provide coverage for a basic package of preventive services, such as checkups and mammograms, without imposing deductibles, co-payments or other out-of-pocket costs on the enrollees. Some PPACA watchers say self-insured MEC plans need not cover the “essential health benefits” (EHB) that other PPACA-compliant plans must cover and need not meet the “minimum value” standards that other PPACA-compliant plans must meet. Some commenters had suggested that HHS should let an insurer sell fixed indemnity coverage to a consumer only if the consumer has MEC that covers the essential health benefits. HHS has decided to let insurers sell fixed indemnity products to any consumer who has MEC, whether the MEC plan covers the essential health benefits or not. “As having minimum essential coverage is generally the standard for determining whether an individual complies with the shared responsibility provision, we believe it is also the appropriate standard for this purpose,” officials say in the preamble. Lawmakers and regulators who dislike the PPACA exchange program or believe that the PPACA rules governing navigators and other exchange user helpers are weak have tried to establish extra, local standards for exchange helpers. In the draft regulations, HHS said states could establish local standards, but not standards that interfere with what HHS believes to be exchange helpers’ statutory duties. In the final regulations, HHS makes a clear distinction between the standards for the exchange navigators — who play a role that was explicitly created by PPACA — and other types of exchange helpers, who have been created by HHS, state insurance regulators, and state exchange program managers. A state cannot require that a navigator hold an insurance license, have a surety bond, have errors and omissions coverage, provide a copy of a high school diploma, meet credit rating reporting requirements, or meet other unduly burdensome standards, officials say. Officials declined to list all of the requirements that they say states should not try to impose. State exchange programs that serve only small businesses may be able to have navigators refer all or most callers to agents and brokers, but states may not normally require exchange assisters to refer users to agents and brokers, officials say. Some states want to require assisters to refer consumers to agents and brokers when consumers may be replacing existing coverage. “We are not persuaded by comments suggesting that assisters can uphold their duties to provide information in a fair and impartial manner and act in the consumer’s best interest if they are required to advise a consumer to consult with an insurance professional when they learn that the consumer is insured or previously purchased health insurance with the aid of an agent or broker,” officials write. PPACA and federal regulations already require the exchange helpers to give impartial advice, and to get no compensation from the coverage issuers, and referral mandates would require the exchange helpers to refer consumers to agents and brokers who can get compensation from the coverage issuers, officials write. The final regulations were signed by CMS Administrator Marilyn Tavenner and Kathleen Sebelius, HHS secretary. 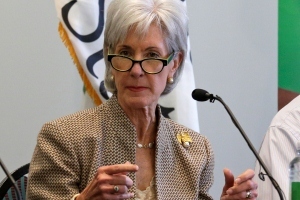 Sebelius has announced plans to leave her post in June.